Can a Bad Spiritual Energy Attach to a Crystal of a Higher Vibration? Is it possible for impish or bad spiritual energies to become attached to a crystal of a higher vibration? I usually keep a piece of celestite next to my bed, to aid me in dream recall and lucid dreaming, but lately I've found that my dreams have been dark and nightmarish. Some literature I've read has suggested using a technique of "locking" programming into a crystal - I have a lot of crystals, and re programming them after a healing session always takes a long time. Could "locking" the programming into a crystal contribute to attractive negative spiritual energies? Thank you for your inquiry. Crystals can work in many different ways. One of the ways they work is to bring challenges or issues to the forefront. This may come across as nightmares or disturbing dreams especially from crystals that we use at night for dream work. Another point to consider is that crystals need to be cleaned often. After using a crystal at night, I put it out to get cleaned by moonlight and charged by sunlight. I find that my dreams aren't as fruitful to me if I use the same crystal twice in a row. By rotating the crystals the dreams I get are much more vibrant and informative. I personally do not program crystals. Although this works for many people, I am more comfortable with letting crystals "do their own thing". 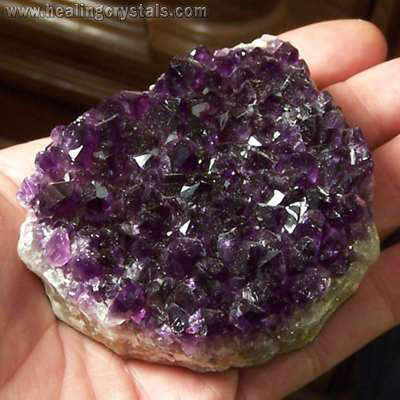 I would try cleaning your crystal and then letting it charge on either an Amethyst Clusteror a Clear Quartz Clusterfor at least two weeks. Your crystal may need to rest and recover.